Have you tried eating food without salt? Many would rather starve than eat salt less food. Salt has become so much a part of our daily meals that it is next to impossible to think of food without it. Sadly, it has also promoted the growing number of cases in hypertension. A vast amount of research supports this view. • High dietary sodium and low dietary potassium have been implicated in hypertension. • Sodium also greatly increases calcium losses from the bones and thus contributes to osteoporosis. • High urinary sodium is associated with high urinary calcium and this may contribute to the formation of kidney stones. • High intake of salt is associated with stomach cancer. 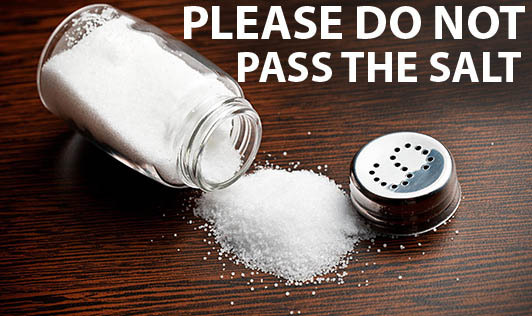 We need to start watching our daily salt (sodium) consumption. Many a time the words `salt' and `sodium' are used interchangeably, but are not the same. Salt is only one source of sodium. Salt is a chemical made up of 40 per cent sodium and 60 per cent chloride. Sodium is found in other forms such as baking soda, baking powder and aginomoto. Sodium, an essential mineral, is necessary for many body functions including water balance and muscle contraction. Sodium is found naturally in many foods but added salt is the major source of sodium in our diet. We get about 300 to 400 mgms of sodium per day, which is naturally present in the foods that we eat. The use of salt in our food is an acquired taste, sometimes just a habit. Salt masks natural flavours. Recommended salt intake is about one teaspoon a day but most people take at least double this quantity. Salt consumption should be restricted from an early age. In ethnic groups in South Australia, South America, Africa and Pacific Islands where the salt consumption is less than 5 gm per day, the incidence of hypertension is reported to be almost nil. Even Indian tribal population is said to consume only around 2 gm per day. In Japan where salt intake is around 20 to 25 gm per day, the prevalence of hypertension is high. In Indian population the salt intake is around 8 to 15 gm per day. Studies conducted at National Institute of Nutrition on sodium excretion through sweat clearly show that even under profuse sweating the sodium loss can be compensated by 5 to 6 gm of salt (or 2 to 2.5 gm of sodium) per day. Under normal circumstances, the kidneys can get rid of any excess salt, but if large quantities of salt are consumed over years, excess can build up causing fluid retention in blood vessels and exerting pressure on the vessel walls. People whose blood pressure increases when they eat lots of salt or decreases when they reduce the intake of salt are called "salt sensitive". For some salt sensitive individuals, an eating pattern low in salt may normalise blood pressure. Higher intake of potassium may significantly reduce high blood pressure related to salt sensitivity. As potassium is processed by kidneys, it is preferentially absorbed in the bloodstream in lieu of sodium. Natural foods are low in sodium and high in potassium which help control blood pressure. But processed foods are low in potassium and very high in sodium, which causes an imbalance. Foods that are naturally high in potassium are - ragi, whole wheat flour, lobia, moong dal, tur dal, potato, sweet potato, brinjal, drumstick, musambi, apricot, musk melon, banana and peaches. Watch out for these high salt foods, they can affect your health - canned foods, cheese, cheese spreads, sauces, pickles, instant foods (soups, noodles, etc), ready-to-eat foods, potato chips, salted nuts, biscuits (specially the salt variety), salted butter, papads, salted popcorn, chiwda, sev, smoked meats, smoked fish etc. Daily sodium intake should not be more than 2000mgms, which equates to 5000 mgms of salt. • Select from a wide variety of foods from all the food groups. • Season foods with fresh herbs, spices, onions, pepper, tomatoes or lemon juice to enhance flavour instead of using salt. • Reduce salt gradually in cooking and baking. • Steam vegetables instead of boiling, to retain natural flavours. • Taste food before adding salt. • Do not put the salt shaker on the table. • Read food labels to see if they contain sodium in any form. • Restrict the intake of salt from an early age. Reducing salt will take some time but the health benefits are worth the change. After you get used to the reduced salt taste, you will wonder how you could have eaten so much salt earlier. From now on do not say, "Please pass the salt" at mealtimes.